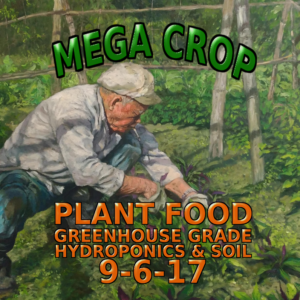 Which crops or plants can MEGA CROP be used on? MEGA CROP can be used as a standalone complete feeding nutrient all crops or plants. It has special forms of nutrients, and complete selection of nutrients, which allows maximum absorption for all plant types, while preventing burning or overfeeding problems, allowing it to work universally. The formula was designed specially for Cannabis, however can be used just as fine with Tomatoes, Peppers, Strawberries, food crops and ornamentals. The important factor is getting proper dosing strength/ppm for your crop. Leafy green crops, which normally need higher nitrogen ratios, can be used with MEGA CROP by running higher ppm/dose than normal to supply the extra nitrogen, or by also supplementing a separate nitrogen product (such as Cal-Mag or Calcium Nitrate). MEGA CROP storage should be done by completely sealing your bag, container after use. Keeping air away from the powder will help it retain its powder form for as long as possible. If you are using the 9.9kg bags, then you can seal up between use by folding the bag and using some type of clip to keep it closed. Al fertilizer products in general should be stored in cool, dry locations as much as possible. The package should be stored out of direct sunlight or heat. Too much sunlight, heat, or exposure to air will cause the formula gain moisture and become clumpy or watery. The formula still behaves the same, chemically it does not change, and it is designed to be water soluble. If the product you have has clumps or hard spots, you can use normal dosage by weight or EC and dissolve in water. Dissolving in water should take place fully from 5-30 minutes. What other supplement or product types should I run with MEGA CROP? Nothing! Since it is a true complete formula, you do not need any other products to get the best results possible. You may want to add some pH adjuster to make sure the nutrient solution being delivered to the plants is between 5.5-6.5 pH for best absorption, this depends on your water supply and is unique to each individual farm. Advanced growers can add in a PK booster during flowering phase, such as Bud Explosion, to ensure you are getting the maximum bloom potential. If I have clumps in my bag, can I still use it? Yes, sometimes moisture will enter from outside of the bag/container, and clumps or lumps can form of MEGA CROP. You can still use this as normal, it does not effect the use or performance! Just use the normal dosage and the clumps will all dissolve in water eventually (usually 5-10 minutes). 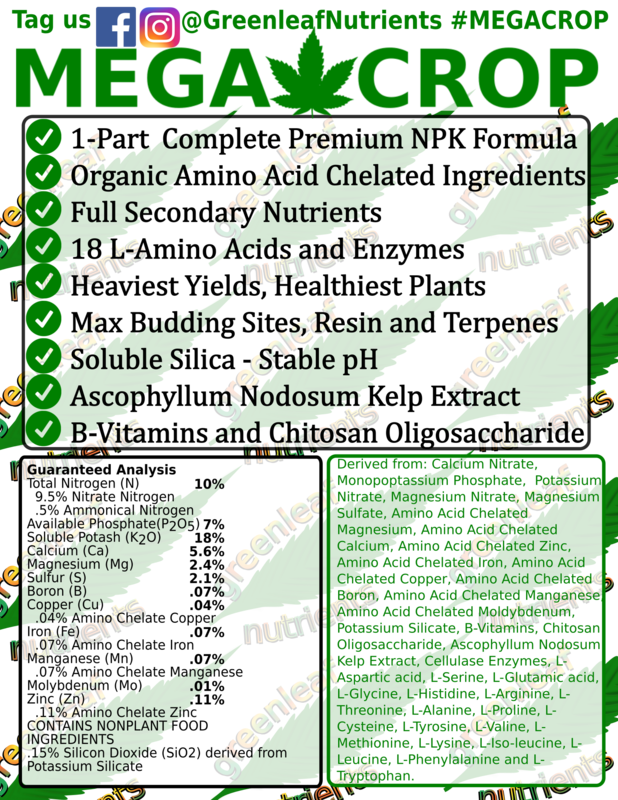 What are the NPK and ingredients in MEGA CROP? I am used to using 8 different products as part of my current feeding plan. Are you sure you do not have any extra products that I need? Yes, we are sure, you do not need anything else! If you feel like you need to add some extra product, you can just increase the dosage with MEGA CROP, since it already has everything in it. If you do not use MEGA CROP as a base nutrient (why not?! ), then we do offer a few supplements from our old product line that we will have available for purchase so you can save money by not using other brands. Also, a few products cannot be mixed in with MEGA CROP during our manufacturing process, for example Sweet Candy has high amounts of carbohydrates/sugars, so it is best to leave it as a standalone product. As a separate product, Sweet Candy and MEGA CROP work together fine and can be mixed. Do I need extra CalMag if I grow in Coco? Most growers will not need extra CalMag even when growing in Coco. 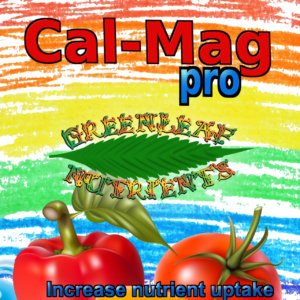 Depending on the brand of coco, strains, lighting intensity, a few growers may need to use either a higher dosage of MEGA CROP, or supplement with an extra CalMag supplement. So you might have to experiment a bit with your own grow to find out if you need extra supplement. How do I use the product, do you have a Feeding Chart or instructions? Yes, we have a custom feeding chart link at the top of the page, or can be visited here. It can help to determine dosage amounts and how to use. How can you use the same formula for both Veg and Flowering phase? Cannabis and Hemp Veg and Flowering nutrient requirements are different, yet fairly similar. Usually, a dedicated “veg” formula will have slightly more Nitrogen, and less Potassium, while similarly a “bloom” formula will have less Nitrogen, and more Potassium. MEGA CROP uses a universal formula that can be used for the entire plant life, we accomplish this in a few ways. Plants take up what they need, so during different phases of growth, the plant will search for what it needs and uptake it from the soil or nutrient solution. As long as you are providing in sufficient quantities, the plant will have optimum growth uninterrupted. This is the same concept that organic outdoor growers will use to get fantastic results, at the beginning of the season they do their “soil mix” which has everything that the plant will need for its whole life-cycle, from start to finish. Through the plants life, it takes what it needs from the soil mix, and as long as everything is in sufficient quantities, it will have optimum growth. We use extremely high quality and low Ammonium type nitrogen ingredient sources, this reduces the possibility of “overfeeding toxicity” that you would get from normal hydroponic fertilizers using too much nitrogen, even at higher doses. So, having extra nitrogen beyond what the plant needs will not harm it. The Feeding Schedule calls for increased dosage for different parts of the plants life. By following the feeding schedule, the plants will always have what they need ready. During each phase, there will be slight excess of nutrients that the plant doesn’t need as much of, however this will stay in the soil and be available in later phases. Are amino-acid chelates better than other micronutrient sources? Yes, amino acid chelates are the best source for micronutrients (iron, copper, etc…). They are absorbed much faster and more efficiently compared to just plain micronutrients, and also work better compared to other chelates, such as EDTA. EDTA chelates are a persistent soil pollutant, and will eventually leech to ground water or runoff water supplies. Also, plants benefit from amino acid chelates compared with EDTA, with higher uptake rates, and also benefiting from the amino acids which the plant can use naturally to promote its growth and flowering process. I live internationally outside of the USA. What is the best way to order to lower shipping costs? Ordering the 21.7lb bag will give you the best shipping rate. Although it may seem a bit expensive, at most it is about $2.80 / lb for shipping to Europe or abroad. Considering that a 21.7lb bag can make over 2000 Gallons, it really goes a long way for the cost. Are the products tested for safety and quality with toxins and heavy metals? Yes, our products have extremely high quality testing standards and exceed standards for growing plants fit for human consumption. 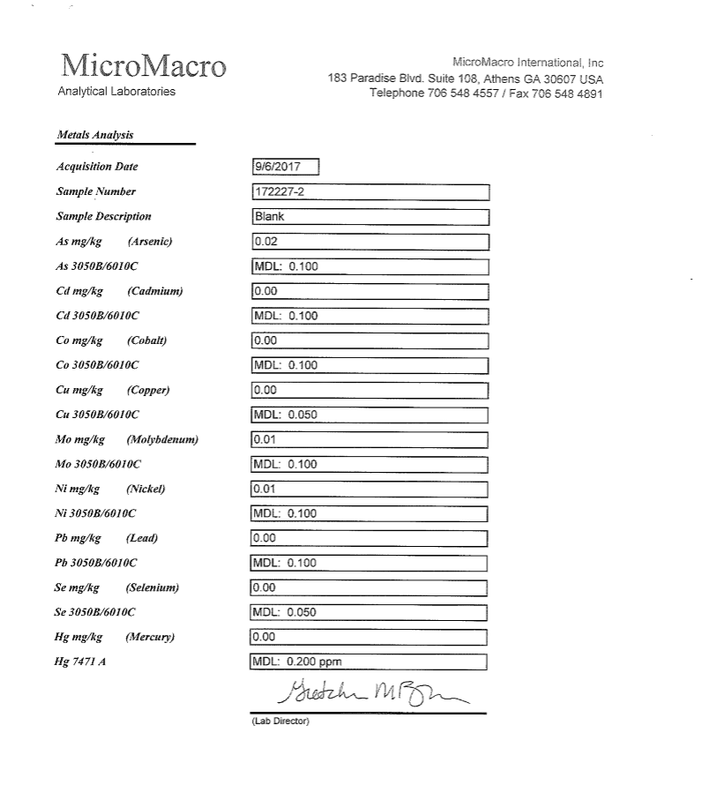 MEGA CROP is tested a minimum of 3 times for heavy metal screening. Testing for Arsenic, Cadmium, Cobalt, Copper, Molybdenum, Nickel, Lead, Selenium, Mercury and more are standard. Products exceed organic level certification requirements.